X-Small - $79.99 Small - $59.99 Only 8 left! Medium - $49.99 Only 1 left! Large - $69.99 Only 8 left! Why is it so easy to rule over Wonderland, but so hard to find a queenly outfit to wear while carrying out your monarchical duties? We can't answer that, since we've never had the honor of being the queen, but we can suggest wearing this royally fancy Queen of Hearts Costume to solve your queenly fashion troubles! What would you do if you found yourself in the Queen of Heart's royal shoes? Between playing rousing croquet games with wildlife (as in, using live animals as the equipment, and not playing against them as opponents, which would still be pretty strange), and ordering anyone she catches painting her garden's roses to have their heads lopped off, this queen has a pretty full schedule. So, it would be understandable that she needs different outfits for every activity, and that would be exhausting! But we assure you, looking like a stunning monarch is nothing to lose your head over. It just helps to wear something that shines, no matter the occasion! This elegant dress is the perfect look for the storybook queen on the go. 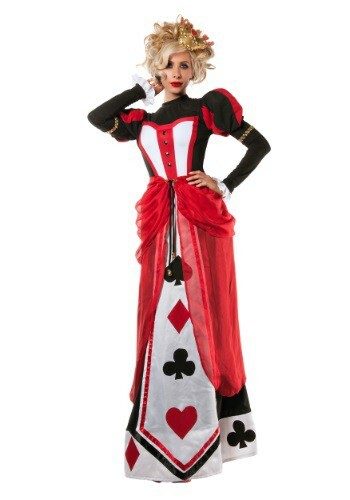 Inspired by the busy queen in the classic story Alice in Wonderland, this full length gown features a playing card suit theme to go with the red, white, and black color scheme. It's a style that is as suitable for a formal costumed function as it is for a relaxing royal get-together. Hey, even a queen needs to unwind, but she can still look fashionable!